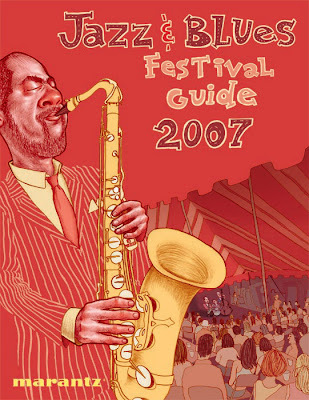 This is for the jazztimes jazz and blues festival guide 2007. pretty straightforward. they wanted jazz and wanted to incorporate a tent and crowd sort of thing. i dont know if i pulled off the tent or not but it made an ok divider at least. I spent a whole day messing around with different color schemes seriously spasming and pulling my hair out finally to end up going with the color scheme i did in 5 minutes the day before. How many times does spontinaety do the trick instead of cold calculated time consuming labor? I'm never gonna learn.